The beauty of this lake has not separated anyone to attract towards it. The lake looks more enchanting with its scenic surroundings. Maharana Udai Singh must have been certainly captivated by the charm of this pristine lake with the perfect backdrop of lush green hills as when he founded the city of Udaipur, he enlarged this lake. He also constructed a dam made in stone that falls under the 'Badipol' region on the shore of this lake. 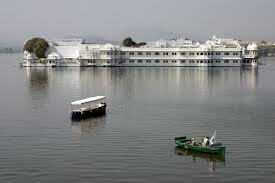 Pichola Lake is enveloped by lofty Palaces, temples, bathing ghats and elevated hills on all its sides. In the southern part of this lake, there is a hill that is known as Machhala Magra and one can see glimpse of Eklinggarh Fort from here. The City Palace of Udaipur broadens along the eastern banks of this lake. Built by Jagat Singh, Mohan Mandir is situated in the north-east corner of Lake Pichola. Boating is the most popular activity at Lake Pichola, and sunset boating is quite enjoyable for most tourists as the pristine blue waters look ethereal at evenfall. The Pichola lake is about 23.6 km from Maharana Pratap Airport, Udaipur and just 2.4 km from Udaipur railway station. Tourists can hire hire tongas, taxis, and auto-rickshaws to reach the lake.